You are Opa-Opa, a ship with wings. Yeah, corny, huh? But don't let that get you down, this game is great! As Opa-Opa, you must defeat all the evil bosses on alien worlds and bring peace to the Fantasy Zone! This game is a port of one of Sega's most famous arcade classics. In my opinion, this was one of their smartest moves, because this port was great! 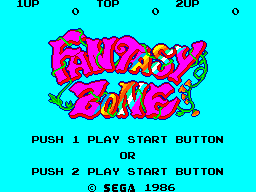 There is not much difference from the arcade version, and when this game was released, because of its popularity, it spawned a few sequals including Fantasy Zone II, Fantasy Zone: The Maze, Super Fantasy Zone (EURO and JPN), and Space Fantasy Zone (Unreleased). Even the game "Space Harrier" is also supposed to take place in the Fantasy Zone. At the beginning of a level, the words "Welcome to the Fantasy Zone! Get Ready!" are displayed. 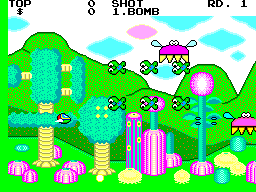 Fantasy Zone is sometimes considered a "Cute Em' Up" because of its bright and colorful graphics, different from other shooters. This is possibly one of the reasons that made it so famous. Opa-Opa for awhile was one of SEGA's mascots, seen in a few other games, such as Zillion and Alex Kidd : The Lost Stars. But why is this game so great? Read on! In Fantasy Zone, to complete a level, you must destroy all the enemy bases and then challenge the boss of the zone. After this, you will be sent to the next level. 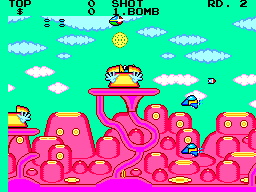 The distinct feature of Fantasy Zone is the control of Opa-Opa. It's not a horizontal shooter, like it seems. You actually get to control what direction Opa-Opa flies in. Don't want to go right in the level? GO LEFT! Or the other way around. The game features many power ups, and when you defeat an enemy, you gain coins. If you collect enough and pay attention a STORE icon will appear. When you collide with it, you will be taken to the Fantasy Zone Store, where you can buy a variety of weapons that power up your speed, bombs, or bullets. You can also buy extra lives. But as the game continues, the prices go higher. You have two main weapons. The bullets on Button 1, and the bombs on Button 2. The bombs are harder to use, and inflict more damage. While the bullets are faster, they are not as painful to the enemy. When you buy power-ups though, usually for the bullets, you will sometimes not be able to keep the weapon for long. You are timed at how long you have to use them, and this can get very tedious. There are dozens of enemies in this game, and they can often be very tricky. Enemies that fly, shoot, and follow you are just some of them. They are tough, and the bosses are no walk in the park, either. The first few are easy, but then they gradually get harder, and towards the end of the last levels, you have to fight them all over again. Annoying, isn't it? If you ever buy too many things by mistake, often a SELL icon comes down, where you can sell some of your power-ups for coins. Later on, you will definately need those power-ups, though. It is almost impossible to destroy tough enemy bases with just the default bullets. Your best bet would probably be the lazer. The graphics are cute in Fantasy Zone, and that's why I love 'em! They are not very distracting, but often the enemies blend in with the background because of the bright colors. The backgrounds are great, though, and are fun to look at. It just gets annoying, because when you battle a boss, the background disappears into a solid color. The enemies are wonderful, too. Smoothly animated and colorful, they are sure to make you forget your playing and 8-bit game! In addition, the bosses are huge and colorful. They look like the arcade versions a great deal, and although I hate how there is no background when battling them, I have to say it adds to your focus on the boss' design and keeps your attention. Wonderful, wonderful, spectacular. Happy little "ditties" that you will have stuck in your head, just like the other review stated. The songs are often fast-paced and happy, and match the sounds for the weapons. The weapon and dying sounds are perfect. They are often just little beeps and boops, but that does not mean they are bad. They just don't distract you from the background music. The sounds often differ from weapon to weapon, and when you die, there is a catchy little tune that matches you exploding into a million Opa-Opa particles! Controls are super swell and super fine. Button 1 fires the bullets, and Button 2 fires the bombs and missiles. The D-Pad is actually pretty good in this game! Pressing the diagonal buttons makes you go in that direction, and can be very helpful. But before you have the big wings, it can be extremely annoying because of your slow movement. The camera doesn't help any, either. Often you can move too close to the side of the screen, and then an enemy will hit you because it hasn't scrolled over yet. But when you get over that, and learn to stay centered, 129.5% great! ADDICTIVE ALERT! ADDICTIVE ALERT! Once you start playing, you can't get enough. Even though it can be super hard at some points, it is super fine, and will keep you playing for hours. When you have the songs stuck in your head, you're gonna wanna play it! I dunno what it is, though, that makes it so fun. Possibly it's the controlling of Opa-Opa, and how you can take him anywhere on the screen! Almost a perfect ten! You must buy this game. If you haven't played SMS in years, bring it out and dust it off, and buy this game, because you won't be sorry! It often can be found for very cheap, but if you even find it for $15 US, get it, because it's worth every cent! I payed $9 US for mine! You should, too! I've been playing it almost every day, and you will too, once you get this game. This is the ultimate piece of value and SMS gold for any collector or non-collector! GET IT!